The three Quatermass serials - The Quatermass Experiment (1953), Quatermass II (1955) and Quatermass and the Pit (1958) - were produced by the legendary Rudolph Cartier, in an era in which live television transmission was the norm and any kind of television recording system was still in its infancy. In fact, the last serial was transmitted only scant months after the first Ampex Quadruplex video tape recorder was delivered to the BBC (in July 1958) and the second machine was not delivered until early 1959. It would be a few more years before the BBC were routinely using videotape for drama programmes. All three serials were transmitted live from BBC studios in London, using the 405-line television system - literally a live, multi-camera studio performance with pre-filmed 35mm inserts played in from telecine. These inserts served the dual role of allowing the story to spread to locations beyond the confines of the television studio, and of allowing time for the actors and cameras to move to the next studio set. 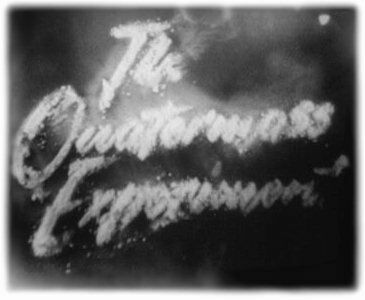 The recordings that survive - the first two episodes of The Quatermass Experiment and all six episodes each of Quatermass II and Quatermass and the Pit - are preserved as 35mm film recordings. Film recording was still very much in its infancy in 1953 - and indeed there is much evidence to suggest that the final four episodes of the first serial were never even recorded, because it was felt that the recordings of the first two episodes had been so poor that it was not worth continuing with. Only two years later however, technology had moved on enough to allow passably good recordings of Quatermass II to be made, and by the time Quatermass and the Pit transmitted, the recordings were of very high quality indeed. 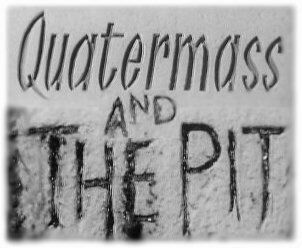 Quatermass and the Pit was performed from Riverside Studios in Hammersmith and recorded using a 35mm stored-field film recording system. This was a system designed to get round the mechanical impossibility of advancing the film forward a frame within the 'field blanking interval' - the very short dead time between the two interlaced TV fields that make up one frame. Only a few years earlier, Quatermass II had been recorded using a suppressed-field recorder, which only exposed one of the two video fields to film, using the duration of the second field to close the shutter and move the film on in readiness to expose the next frame. This meant that the vertical resolution of the suppressed-field image was less than two hundred lines, resulting in a very coarse, steppy image. Stored-field got around this problem by 'storing' one field using the long decay time of the phosphor coating on the film recorder's cathode ray tube and allowing an entire 20mS field period to allow the film to be advanced to the next frame. During the first field, the camera shutter would be closed and the film would be be advanced. At the same time, the first field would be written out to the CRT at a very high intensity, so that the image retained by the phosphor afterglow would still be visible 20mS later when the shutter was opened and the second field was written 'live', interlaced between the lines of the fading image of the first field. The live field was written at a much lower intensity, so that its level matched that of the stored field, resulting in a full resolution picture being captured onto the film. Two film recorders would have been used to record the shows as they were transmitted, each one recording approximately nine minutes of material before the other was run up to record the next section. The operators would try to ensure that there was an overlap of one entire shot recorded by both machines, so that the reels could subsequently be joined at a shot-change, rather than mid-shot (which would have highlighted geometrical and other differences between the two recordings). All six episodes of the serial exist as 35mm film recordings with combined-optical soundtracks. There is also a two-part compilation version of the story, which was broadcast in the early sixties, which has some material trimmed out to fit into the required running time. Before any real transfers got underway, we carried out tests to ascertain if there was any advantage in transferring the original film recording negatives rather than prints made from them, and also if we could utilise a less-expensive telecine than the Spirit we tend to use for 16mm transfers. This showed that, because the 35mm frame is large and the 405-line image has limited resolution, there was no perceivable quality difference between using the prints or the much more valuable negatives, or between the Spirit and the less expensive Cintel Ursa Diamond flying-spot telecine. The Ursa also gave another advantage, in that it has the ability to alter the shape of its scanning spot. In this case, we could elongate it so that it effectively slightly defocused the image vertically, helping to break up the visible line-structure of the 405-line raster. A later development of the film-recording process would be a technique called 'spot wobble' which would do very much the same thing, but in the film-recorder itself. To begin the restoration process, the prints were called up, ultrasonically cleaned, and transferred 'one-light' on the Ursa to Digital Betacam videotape by the RT's Jonathan Wood. Each episode was then digitally graded and DVNRed tape-to-tape, cutting out a couple of dirty frames at each vision cut so that shot changes were nice and clean. After the episodic pictures were to length, with any rough vision edits repaired and film sequences replaced, they were dubbed to DVCam tapes and sent to me. These tapes still contained the optical sound from the original telerecordings. I also received DVCams of the two-part compilation version, with the 16mm magnetic sound. All of these materials were captured into Final Cut Pro on the Macintosh, maintaining the programme timecode on the episodes for reference, then dropped into Nuendo and the soundtracks imported onto tracks for treatment. With the episodes on the timeline, I then went through all six programmes match-cutting the magnetic sound to sync. Where scenes had been cut from the compilation, I dragged the relevant optical sound onto a "keeper" track for use, retaining the full synchronised master track for later reference. I ended up with a patchwork of audio clips, all synchronised with the pictures but needing restoration. The 16mm mag tracks are copies of the original (lost) 35mm mag. I suspect that they are in effect a salvage dub as they are a little rough in places - perhaps the 35mm had started to decay. Nevertheless, they are far better than the optical sound, with less noise, distortion and sibilance. One thing I immediately noticed is that the levels on both the optical and mag tracks are very variable - one suspects that they did not have particularly sophisticated gain control devices in the studio at the time and relied on the transmission limiters to cope...however they also often kept the level very low, perhaps expecting a loud peak which never came. This was a side effect of making the original programmes "live", but it can be corrected in mastering with some careful riding of the dynamics and leads to a far more even and acceptable listening experience to modern ears. (I later discovered that neither "The Quatermass Experiment" nor "Quatermass II" suffer from the same problem to anything like the same extent, which makes the varying levels on "The Pit" even more baffling.) More worrying was the occasional off-mic or very quiet line which tended to disappear beneath the noise floor. Hence I had to carefully ride the noise reduction levels at times to avoid filtering required sound with the hiss! Despite the credit for "music specially composed", the score for this story was all from "stock": library tracks composed by the great Trevor Duncan. A prolific composer, Duncan's output was so great that no single library was ever able to publish it all, so his work appears across numerous labels: Boosey & Hawkes, KPM, Conroy, Impress...to name but four. After much digging through the archives and many emails and telephone calls, I was able to secure new copies of a number of tracks including "Mutations" from the KPM library (used for the opening titles, all closings except episode six, and in other places as well), "The Conquest of Space: Escape Velocity" (used for the recaps in episodes two, three and four) and "Cathedral: Vision", which closes episode six. It makes a big difference to open the show with a really high quality copy of "Mutations", and the new copy of "Escape Velocity" helped enormously in cleaning up the recaps - all of which, barring episode four's (which opened the second compilation episode) only exist on the optical track. Nevertheless, it is these recaps which remain the least satisfactory part of the restoration, the original mix being less than perfect. "Mutations" was originally released on the Conroy mood music label, and KPM - who now own the rights to that library - were kind enough to send me a new digital copy direct from the master tape. Ironically, we also found a copy of the original 78rpm disk in a storeroom at BBC Pebble Mill. I had hoped to replace some additional music cues: the recaps at the start of episodes five and six and that accompanying the appearance of Hob over the dig. But this music, Trevor Duncan's "Four Evil Men" suite, eluded us. The BBC no longer hold copies of those 78rpm library disks (the few at Pebble Mill being retained simply because nobody had ever cleared out this particular storeroom) and even the original library, Boosey & Hawkes, no longer have it. For my future pleasure, I am continuing the search, and resign myself to the fact that copies will undoubtedly surface a few days after I deliver the final masters! Clicks and pops were removed where appropriate, but I went easy on correcting "mistakes" unless they were very distracting - this was, obviously, live television, and I do not think that we should disguise that fact. I was very tempted on a couple of occasions to add in additional or alternative effects (for instance, the very wooden thud of pickaxes in the pit, or the hollow thump and boom of feet on the wooden rostra that formed the floor of the supposedly metal inner surface of the capsule), but resisted. For the same reason, editorially, the RT has left in a couple of instances of actors obviously waiting for cues, which were actually cut out on the original repeat compilation version. To us, it all adds to the excitement of this being "live". Though I did tone down the frequent off-camera coughing fits of one crew member in episode three...and I removed a prominent microphone knock in episode four. During the opening film shots of the crane in episode one, there is some flanging / double-tracking on the sound - this is present on both the mag and the optical, so is probably an error on the original recording, or could even be due to a poorly-positioned microphone on location. There is also a fair amount of distortion on this sequence (the noise of the scoop, the foreman shouting) which is deeply ingrained and impossible to shift. Matching the 35mm optical sequences to the mag track was tricky at times, as it was far noisier. In many instances I resorted to using very heavy noise reduction, then rebuilding the background behind the track - for instance in the episode one scene with the reporter doing "vox pops" outside the dig. This was not possible, of course, where there is no background sound to rebuild - office scenes in the later episodes, for instance. In these cases, I have tried to disguise the joins in various ways, or at least make them less objectionable. But there is an unavoidable rise in the noise floor, and constraint of the frequency range, at these transitions and, in order to make them more even, I backed off on the noise reduction of the magnetic tracks on these sections as well. There is always a trade-off...a couple of optical sound sequences in episode three proved particularly difficult to match in to the mag - mainly because the transition from one to the other was too much of a jolt mid-scene. In these cases, the optical sound has been "held" longer than one would like, in order that the transition may be better disguised. Episodes two and six were particularly affected by little electrical clicks which have now been removed, while episodes three and six had many dropouts which were not present on the optical track, and which must therefore have been copied from the decaying 35mm original, or are a dubbing fault. All were patched, occasionally from the optical track. One nagging problem remained at the end of all this - one large unrepaired fault which really bugged me. In episode one, at about 08:10, Roney is showing off his model ape. He says, "Now these modelled portions that you see are what we've found so far....he wasn't very tall". Annoyingly, the words "modelled portions" and "tall" are obscured by distortion. The problem is present on the mag and the optical, so probably happened in studio or on studio output - possibly a dirty connection somewhere. And the noise doesn't just obscure these words, it totally replaces it - so no amount of de-clicking, de-crackling or drawing was going to fix it. It is obvious from the context (and Nigel Kneale's script book!) what these words are but the bursts of noise are distracting and spoil the scene. So I have - sort of - solved the problem of "tall" by cutting it a bit short and adding some reverb, which I think is less distracting than the noise. But "modelled portions" was still impossible to fix. In the end, I have done something a tad radical. I found some other words, and pretty much seamlessly re-wrote the line so that it reads, "Now these rough fragments that you see are what we've found so far...". Roney moves behind someone at this point so the lipsync is obscured, and I think the line still makes sense. The casual viewer will, I hope, not notice anything amiss, whereas he *would* notice the burst of distortion. And I trust, therefore, that both the purist fans and Mr Kneale himself will forgive me this little licence. In common with the rest of the team, I was probably more excited at the prospect of working on "Quatermass and the Pit" than many other things we've restored recently. This despite the amount of work it would undeniably take - and our budget and time was tight, with episodes up to a third longer than "Doctor Who". But "The Pit" is a classic of the first order: gripping drama that still holds up well. What I love about it is the way the drama unfolds naturally, without being forced and without gimmickry. The early episodes are leisurely - slow, even - by today's standards - but rather than seeming "old-fashioned", it simply demonstrates to me all that has been lost with the current fad for fast cutting, sensation, and the schedulers' paranoia that the audience will lose interest and switch channels. That early restraint also serves to underline the apocalyptic and genuinely shocking events of the last episode - even if they take place almost entirely off-camera. Quatermass and the Pit is a class act, whichever way you look at it. The serial is also a lovely lesson in technique, even if some decisions *do* seem strange by the standards of today. For instance, they seemed to feel that music and effects could not co-exist. Look at the sequence in episode one where Miss Dobson has her funny turn, or the later sequence at about twenty-six minutes in, where the "bomb" is being examined with a stethoscope: as soon as the music comes in, all the traffic noise (which would have been played in from 78 rpm disk) disappears. This is exposed even more now that I have removed the tape hiss and mains hum that plagues the original recording. Of course, it may have been as much a technical decision as an artistic one - with limited play-in decks available, the grams operator may well have used the presence of the music as an excuse to re-cue the traffic disk to make it last longer! Quatermass and the Pit had previously been released as a two-part compilation version by BBC Video on VHS in the mid-eighties and latterly the same master had been used in Revelation's DVD release. Strangely, BBC Video had elected to make up their own compilation version from the episodic version, rather than by simply transferring the existing BBC TV compilation - which meant that the original 35mm film sequences had never been a part of the commercial release. The following examples compare the original BBC Video transfer (taken from Revelation's DVD) on the left against our new transfer on the right. The area outside the red box superimposed on the new transfer is roughly the amount that was missing from the earlier release simply because the entirety of the available image had not been scanned before! Surprisingly, considering its age, there were no major nasty surprises awaiting us. 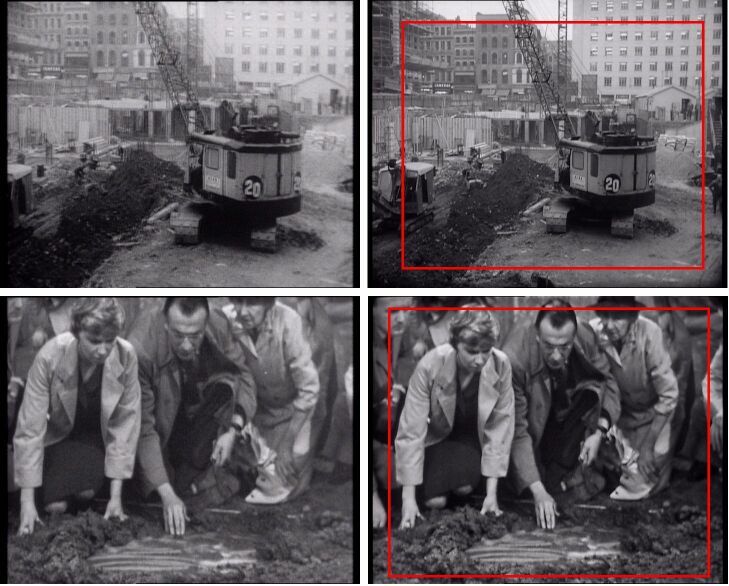 The first two shots of the opening episode (a shot panning down from the Hobbs Lane / Hob's Lane signs to the construction site, followed by a shot of the contractor's sign) suffered from severe flicker, which we assumed was a film recorder fault. However, the second of these shots exists as real 35mm location film in the compilation - and was just as flickery! We can only assume that there was a shutter fault in the 35mm camera, but they had no option but to use the shots. These were de-flickered for us by Ian Simpson at BBC 3dfx using Furnace running on a G5 Mac. In episode two, there is some bad luminance flashing across the middle of the picture on a shot of Quatermass moving into the derelict house. 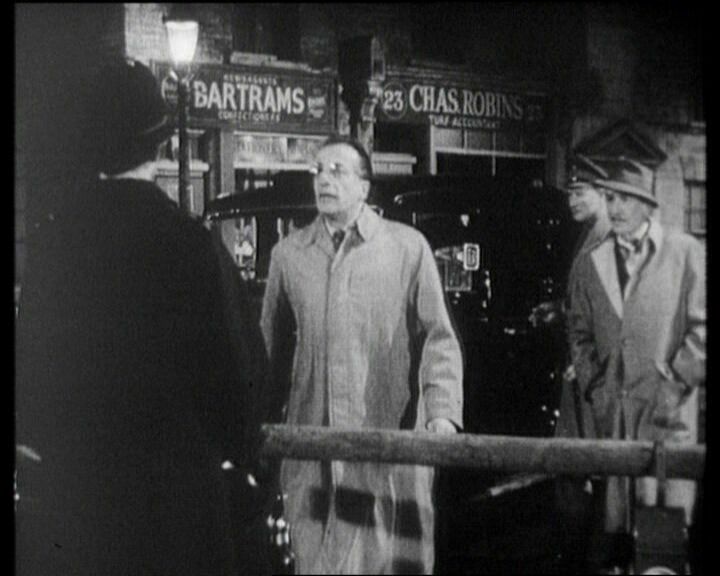 However, the break-up is over only a few frames in which actor Andre Morell is effectively just sliding sideways over the background. This was fixed using Furnace running on a G5 Mac to generate 16 new clean frames between the last and first good frames surrounding the fault. The background had very little detail and contrast so tended to morph over a second which looked very false, so the background was painted back in as much as possible. Finally grain from the surrounding film was sampled within Combustion and then added to the replaced segment. Several shorter off-locks were fixed with more conventional retouching. Because many of the insert film shots mix to or from the studio shots at their beginning or end, the compilation editor in the early sixties had tried to maximise the amount of true film material by cutting from film back to the film-recording just prior to the mix. This gave a nasty jump-cut, because the image on the film recording was generally of a different size and quality to that on the film. In order to avoid this, we used a number of techniques - let's assume we're coming to a transition where the film mixes back to studio. The most obvious technique is to cut back to the film recorded material right at the beginning of the shot which ends in the mix, which is very easy to do, but reduces the entire shot back to film-recorded quality. Alternatively, we could sacrifice some material from the end of the film shot and from the beginning of the studio shot, remaking the mix electronically. We did this on a couple of occasions, but only where it sacrificed nothing of importance - certainly we would not countenance loss of any dialogue or important action. The other technique which could sometime be applied was to match the geometry of the new transfer to that of the film-recorded version of the transfer, mixing across between the two at a suitable point near the end of the shot. A good example of this technique can be seen near the end of episode one, where Roney runs up the ramp out of the excavation. At this point, the film recording suffers from being out-of-phase with the film, resulting in the classic double-imaging problem which is often seen on film-recorded film inserts. To avoid having to take the entire shot double-imaged, the beginning of the shot is from film and as the camera pans and blurs to follow Roney up the ramp, we mix back to the film recording over a second or so. In episode five, there is a strange jump cut on the scene where Roney runs over to steady Miss Judd, who is being influenced by the emanations from the ship. Roney is at one side of the studio and then suddenly on the next shot he is on the other side of the studio, steadying Miss Judd. As this is on a part of the live studio action, it must have been cut out after transmission. Our first thought was that the shot was on the boundary between two film recorder reels and that part of the shot had not been recorded in the changeover, but when we checked the original film recorder negatives, that shot was mid-reel. This lead us to assume that there was a technical fault on the recording, most likely a large film recorder off-lock at this point, which had subsequently been excised from the negative. However, research by Andrew Pixley indicates that 1' 25" of the episode was re-performed at the end of the recording, presumably to cover either a technical or artistic problem encountered during the performance. Episode five ends abruptly, losing the caption announcing next week's episode. This has been re-created digitally in a matching style. The reason the material is missing is most likely to be that it was right at the end of the film recorder's roll and the operator had gambled that there would be enough film. Following manual clean-up of the pictures, a new and improved version of the VidFIRE videoising process was used to return the fluid motion, video-look to all of the sequences which were shot using electronic studio cameras. This is the only story of the three where we judged the quality of the film recording process to be high enough to enable VidFIRE to be applied convincingly. 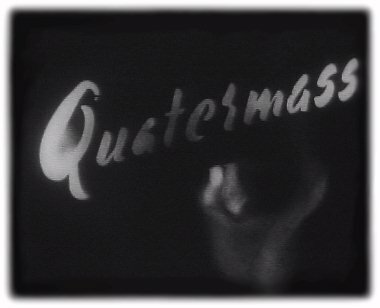 The majority of Quatermass II was recorded from Lime Grove studios in Shepherd's Bush using a 35mm suppressed-field film recorder and as such it has much poorer image quality than Quatermass and the Pit. The television line structure on these episodes is very visible and the picture itself is made up of less than two hundred lines. For some reason episode three was recorded on a different kind of recorder to the other episodes - it was probably a pair of Moye-Mechau recorders (an upgraded version of the machine used two years earlier to record The Quatermass Experiment, which used a Mechau mirror mechanism and a Moye camera). The optical soundtracks produced by both these recorders was of the higher-quality variable-area type - a significant improvment on the variable-density recording used on Alexandra Palace's Mechau machines. All that now exists are the 35mm com-opt film recorder negatives and prints, plus a few 35mm model sequences from episode six. If magnetic soundtracks ever existed, they are long gone now - and unfortunately the com-opt soundtracks are very poor in places. What is particularly noticeable is how much poorer the overall technical quality of the production is compared to Quatermass and the Pit, which was only three years later. The studio cameras suffer from peculiar black and white shading towards the edges of frame, so it is impossible to get a consistent luminance level across the entire picture. The vision-mixer cuts appear to be via a simple mechanical switch operating directly across the outputs of the cameras, and the bounce in the switch contacts causes between two and seven frames of flashing and distorted video at each cut. All of these distracting frames had to be edited out to make the pictures more acceptable, offsetting the audio edit in order not to lose or damage any dialogue in the process. The episodes are also plagued with variations in black level throughout, often varying within a shot. Whether this was caused by automatic variations in the recording chain (maybe some kind of automatic level control) or by engineers in the studio changing the camera racks throughout the show, the net result is that a lot of time had to be spent programming in dynamic grading changes in order to smooth out the variations as much as possible. As with Quatermass and the Pit, tests showed that nothing was to be gained by using the negatives instead of the existing prints, so generally the prints were telecined. The exception to this was the first reel of episode five, which was found to be badly scratched, so the negative was used instead. In part one, there is some damage to the picture and soundtrack caused by sprocket picking, but it was found to be printed into the picture, indicating that the damage is to the negative. There is also some fine vertical scratching during the opening few minutes of episode one, which can also be seen on the clips of that episode used in episode two, suggesting that the film damage was caused either during its recording, or during production of the recaps for the beginning of the second episode. Episode four famously opens with a BBC caption and a voiceover warning that the BBC considered that the show was "unsuitable for children or those of you who may have a nervous disposition". The quality of the caption slide recording is very poor, but Andrew Martin at the BBC's Windmill Road archive was able to locate a proper 35mm film of the same caption which has been used to replace the recorded version. Good use was made of location film inserts, but the telecine technology of the time was not very sophisticated and often the film sequences are poor quality and generally very badly black-crushed, especially in episode five. In fact, clips from the same episode five sequences that appear in the recap on the following episode are much higher quality, but aren't long enough to be inserted back into the episode. Unfortunately, most of the original inserts no longer exist, so very little can be done to make these sequences more acceptable. The exception to this are the model shots of the 'Quatermass II' rocket from the last episode, which still exist as 35mm negative and which were used in this restoration. The image was softened down a little in order that the much higher resolution didn't make the sequences stick out too much, but the much increased levels of stability and low-light detail made it well worth doing. All of the episode recap sections were originally formed by editing together a compilation culled from the film recordings of the previous episodes, which were then played out live from telecine. As these sections survive as a film recording of a telecine playout of another film recording, their quality is much lower than that of the same scenes in the episodes themselves. So each of the five recaps were rebuilt during restoration, using the remastered previous episodes as the source. The first job here was to locate a clean recording of the opening theme music. And, without much ado, a copy of the original mono Curwen NIXA recording of Holst's The Planets - featuring the Philharmonic Promenade Orchestra conducted by Sir Adrian Boult - was found in the BBC Music Library. And when I say "original", I mean "original": an early 33rpm vinyl LP, it was in pretty poor condition, played to death with ingrained surface noise and awash with crackle. It is, indeed, very probably the self same disk as used on the original transmission, though for that it was copied first to 78rpm disk and thence to 35mm mag to be married to the titles film each week. After a morning spent decrackling and denoising I ended up with a recording which, while still not perfect, was at least useable, and I replaced it at the head of each episode in preference to the scratchy optical track, also replacing longer music-only passages in the recaps. I then tried to replace the closing titles music. Both cues used here are pieces by Trevor Duncan from the Boosey & Hawkes library. For episodes one through five, the track is "Inhumanity", while for episode six it's "Project" from "Transitional Scenes Pt 2". Again, we found that the BBC Library has not retained these 78rpm recordings, and they were not to be found at Pebble Mill. But while B&H themselves no longer have masters, they were kind enough to loan me their remaining copies of the original disks. Sadly, however, it was not possible to get a useable transfer of these done in the time, and a broadcast turntable with 78rpm playback and a selection of styli is now on my shopping list! Nevertheless, the closing titles on episode one were pretty good (after cleanup) and were themselves used to repair ragged endings on later episodes. Cleanup then continued as usual - large amounts of noise reduction with careful riding of levels, and manual removal of more stubborn clicks, pops and bumps: nearly 2000 in episode one for starters. This manual cleanup takes a long day per episode, and it is necessary to take frequent breaks - staring at waveforms on a computer monitor can make your eyes go funny after a while, to say nothing of the RSI from constant clicking and dragging with the mouse! There were a few bursts of interference distortion in episode one - this is printed-in from the damaged negative and they are accompanied by corresponding scratches and blemishes on picture. This noise has been cut around where possible, filtered and re-drawn where not. But some vestiges remain (sounding, I realised as I checked these masters at the end, like someone softly passing wind...); with more time it might have been possible to reduce this some more, but the law of diminishing returns applies! Throughout episode two a musical "sting" (one of a number by George Arnos used in this story, from the Paxton library) is heard a number of times. Each time, the disk from which it was played (probably a 78rpm soft acetate "working copy" made from the original) gets more worn - especially on the run-in where it was cued. Heavier doses of click and crackle reduction had to be used on each occurrence to clean this up. The same sting - and, sadly, disk - will return in episode four, disintegrating still further. Once again, I was very wary of correcting "mistakes" in this live recording. However, in episode two when the truck pulls up to take Dillon away, the studio mixer quite neglected to fade up the film sound until a few seconds into the shot. As this was so obvious, and rather distracting, I fixed it. At about 9:40 in episode two, as we enter the "Camp Voluntary Committee Duty Office", the sound mixer fades up the wrong microphone (one on another set, by the sound of it) and the first couple of lines of dialogue can barely be heard - there is nothing that can be done about this. The remainder of this scene is affected by a number of large bassy "bumps" in the audio - possibly handling noise from a poorly-mounted boom microphone. These effects have been cut around or filtered as possible. Sadly, the same affliction was found in a couple of later scenes but, with time running out and the delivery date looming (I was working on this section between Christmas and New Year), I was unable to be as thorough here as I would have liked. Hence a fairly steep low cut filter was applied generally to soften the effect without cutting into dialogue. The levels on episode three were a tad high in places, especially in the opening scene in the Inquiry where the sound mixer had used a clever perspective mixing technique to heighten the tension, so I gently rode the gain to correct this - while maintaining the overall dynamic. This episode was generally pretty clean (indeed some passages were so clean they could have com off mag - thankfully, after the terrible state of the first two programmes!). The worst section was that around the picnic sequence - the dialogue is very noisy and rather "scratchy"; there was little more that could be done here than some fairly heavy denoise and a lot of click removal. And it's at about this point in the proceedings that a massive earthquake in the Indian Ocean sends huge Tsunamis to devastate hundreds of miles of the surrounding coastline across numerous countries. I sit back from the computer for minutes at a time over the next few days as everything finds - as it often does in this mad world of ours - a new perspective. Drawing clicks out of the soundtracks of 50-year-old TV shows suddenly seems - as indeed it is - desperately trivial. Nevertheless, it is how I earn my living, it is how I feed, clothe, and educate my sons. But a proportion of what I am earning on this job will now go towards the disaster relief fund. The restoration proceeds pretty much as before, though some scenes come as a shock: the sequence in episode four where the meteorite hits the Comedy Irish Pub was in a terrible state - especially where the zombies enter - and many hundreds of clicks and bumps were removed in the space of a couple of minutes (and a few hours hunched over the Mac!). Episode five proved to be the hissiest of the six, while the final episode turned out to be generally pretty clean under all the surface noise. In this episode I did help the dynamics at a few points (the rocket launch, the impact with the asteroid, and the nuclear detonation at the end), and I repaired a hole in the soundtrack where the studio master fader appears to have been ducked accidentally. A word or two was missing here, so I have nicked one from elsewhere to cover - but I'm not telling where this was! Nothing could - or should - be done about the atmosphere on the alien asteroid, which sounds like a plumbing disaster in a rather palatial bathroom! Similarly the asteroid's very wooden-sounding surface. One problem was impossible to fix, and that comes near the end: Leo is holding Quatermass at gunpoint, "You have done as intended!". There is what sounds like a film break here, and it exists on both transfers I have heard, the word "intended" being interrupted with a large blip. All I was able to do here is to soften the "blip" so that is does not sound so bad. Picture restoration was more a case of damage limitation due to the poor resolution of the source, especially film inserts. Two passes of deblobbing were done to remove the worst of the dirt, sparkle and scratches. Electrical interference affects many short sections particularly in episodes one and two These have been improved where possible but without a large budget and lots of time, complete repair would be impossible. In several places throughout the episodes one or two frames are missing from the print resulting in a picture jump. These have been repaired by generating new in-between frames and trimming the end of the shot to maintain audio sync and episode length. The Quatermass Experiment was recorded on Alexandra Palace's Mechau film recorders - actually a clever re-engineering of a Mechau projector mechanism. 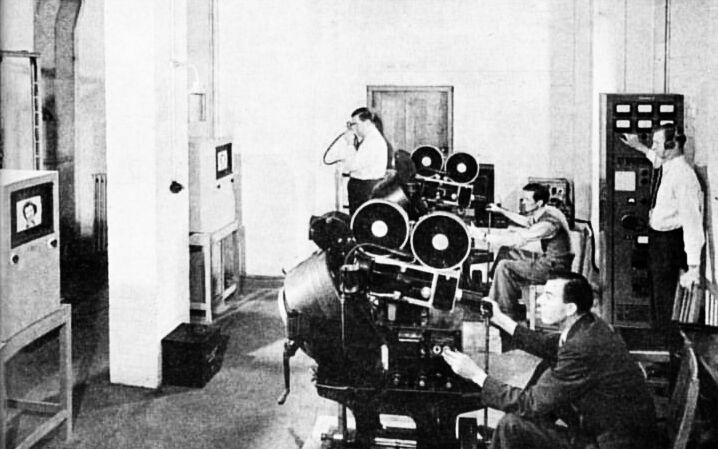 Unlike a conventional projector, where the film motion is intermittent due to the frame being pulled down into position and stopped before the shutter opens, the Mechau system used a continuous film motion, with the position of the moving image accurately tracked back to the lens by rotating mirrors. Film recording at Alexandra Palace consisted of a pair of Mechau units, each focused onto a high-quality monitor screen positioned a few feet in front of them. The area was lit only by a dull red light during operation, as the optical path was open to the room instead of being totally enclosed as it would be in later film recorders. There was no servo system as such to link the recorded framerate to that of the video signal - instead, the operators would vary the speed of the recorder's motor using a long joystick device, with reference to a crude meter which allowed them to match the frame rate to video. The Mechau's could be used as telecines by reversing the process and placing a television camera where the film recording monitor would have been! Although the Mechau recorded both fields, the image resolution was limited by the optical system used to scan the film, so the overall image quality is worse than Quatermass II, although the lack of visible line structure helps somewhat. The optical soundtrack was recorded using the crude variable-density method, which would be superseded by variable-area recording. The same recorders were used the following year to record Cartier's production of George Orwell's Nineteen Eighty-Four, which is noticeably better quality. As with Quatermass II, it seems to be the quality of the Emitron studio cameras that really causes problems, with the same visible problems with large areas of black and white shading and very vignetted images. Episode two's recording is of a lower quality than episode one and there are some nasty technical problems on display. At one point the image collapses vertically, before bouncing back, turning negative, then positive again - but only in the top half of the screen - before finally settling down. For most of the second half, an insect can be see sitting on the film recorder monitor, its image indelibly burnt into the film recording. At several points in the recording the picture is affected by severe amounts of random impulse noise, probably caused by a bad connection or a noisy thermionic valve in the video amplifier. High levels of noise reduction were applied during remastering in order to try to bring this under control. Part of Judith Caroon's dialogue is lost immediately following a reel join roughly 13 minutes into the episode on the print. However the negative of the reel immediately preceding the join has the dialogue intact, so we were able to recover it. Despite the poor quality of the pictures for this story the audio recordings - underneath all the noise - are actually pretty good. For a start, the levels are far more consistent than on the Pit, and I only needed to tweak them by a decibel or two here and there. I was unable to locate a copy of the original recording of the opening music used on this story - "Mars" from Gustav Holst's "The Planets". The recording is conducted by Albert Coates (who also conducted the public premiere of the work in 1920) and appeared on the HMV label. Research suggests that the recording was actually made in 1929, and would certainly have been played in live to the transmission of the episodes from 78 rpm disk. Strangely, the music at the start of episode one is played at the wrong speed - so fast that it is 3 semitones high. This may have been deliberate (to give a greater sense of urgency to the start of the story) or in error: So-called "78s" were often recorded at different speeds, anything from 60rpm to over 100rpm, and the playback deck may have been set at the wrong speed. The opening titles at the beginning of episode one have a clean start, but there is a film break leading to a discontinuity in the music. The music is truncated at the start of the second episode, and this time riddled with dropout. Hence I repaired the film break in episode one with some nifty editing, then copied the file and varispeeded it down by 3 semitones to use at the start of episode two. The episodes were subjected to some pretty severe noise reduction and passed through a de-crackle plugin at a high setting to remove most of the film surface noise. Noise reduction thresholds had to be "ridden" at times to make sure that some very quiet dialogue was not removed. But the noise reduction could not deal with the worst of the clicks and pops - I manually drew out over 500 large clicks in episode one, and 1200 in episode two (for trivia fans that's around 1 every 3.7 seconds in episode one, 1 every 1.6 seconds in episode two! ), while even more severe clicks and bumps were cut out and the spaces filled with patch noise lifted from elsewhere in the episodes. The original music used on this story proved impossible to locate in time but I did use a good take of music at one point in episode one to replace a poorer take later: Trevor Duncan's "Lost in Space" which was used over a couple of the long black "passing time" passages, was good on the first but very unstable on the second, so the first was copied up to cover. One major snag occurred in episode two. On the existing print, there is a line missing, "I wanted him to come back more than anything else in the w(orld)" at the reel change - the picture is there, but there is a big hole in the soundtrack. As it had been decided to use the existing print as the source, Steve Roberts had a new transfer of just these few seconds of the negative made so that the soundtrack could be repaired - but there was a problem with this. The soundtrack is a variable area optical track - in other words the waveform is represented on the prints by an optically printed pattern where waveform peaks are shown by a wider transparent area, and troughs (silence) by black. This is a terrific system in that the black passes no light and therefore also lessens the inherent noise in quiet passages. Obviously, the clear area picks up dirt and scratches so louder passages tend to be noisier - leading to the characteristic optical whoosh of sibilance on some tracks where the signal is not enough to cover that greater level of noise. However, on the negative of course, the silence is represented by a wide clear area, and the peaks by darkness - hence, a very high "ground noise" level which all but masked the line we wanted. I have, therefore, had to use a severe amount of noise reduction on this one line to try to match it in, so severe that the "glassiness" of the noise reduction is apparent - yet I felt it preferable, and less distracting, than a sudden burst of noise at this point. In an ideal world, of course, we would have had a new print struck, but it could not really be justified for a single line. For many years, there have been a number of theories put forward to try to explain why only the first two episodes of the show still exist. The favourite rumour for many years was that there had been a technician's strike and that industrial action had prevented the recording - although researchers have been unable to find any record of such action. Later it was claimed that the S.Tel.E. (BBC parlance for the Senior Television Engineer) responsible for the recording area had been so disappointed by the results from the first two recordings that he refused to allow them to continue. To further complicate the matter, Canadian TV listings appear to indicate that the first two episodes had been scheduled for transmission in Canada, although it is unlikely that the transmissions actually took place. Records on INFAX, the BBC Archives database, indicate that the Canadian Broadcasting Corporation hold copies of the first two episodes as 16mm reduction prints, adding further weight to this story. The interesting question is... why was the serial was even being recorded in the first place? Whilst it may have been very useful to record it for recap purposes, the evidence from the extant second episode shows that the recap took the form of a replay of one of the proper 35mm film sequences from episode one, coupled with a camera pan down the actors standing in a line as a narrator covered the events of the previous episode. Is this always how it was intended to be? Or was the quality of the first episode's recording so poor that the film-recorded studio material was deemed to be unsuitable for use even in the recaps, necessitating the use of this particular technique? Was it being recorded for Canadian TV and did somebody call a halt after the second episode when it became clear that the technical quality had dropped sharply - and that there was a fly sitting bang in the middle of the screen for much of the episode? We will probably never know the complete answer... but all the evidence sadly seems to suggest that recording was stopped after episode two. All of the restoration work was carried out by a small and experienced team, without whose dedication and skills a release of this quality simply would not be possible. Telecine transfers, grading, editing and noise reduction was carried by Jonathan Wood at BBC Resources. Picture cleanup and VidFIRE processing was carried out by a specialist team at SVS. Audio restoration was by Mark Ayres. The project supervisor was Steve Roberts. The team would like to thank BBC Information and Archives - and in particular Andrew Martin at the Windmill Road archive - for arranging complete access to the Quatermass master materials during the project. Copyright Steve Roberts / Mark Ayres, January 2005. No duplication without written consent!